Award-winning antivirus for Windows. Essential defense against malware, built on ESETs trademark best balance of detection, speed and usability. 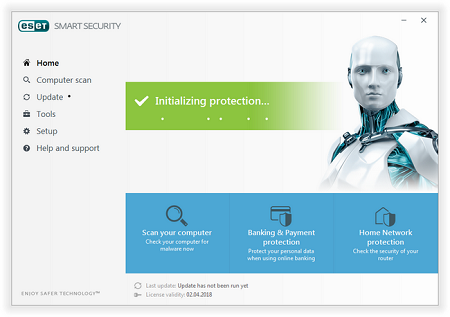 Enjoy the internet, protected by the legendary ESET NOD32 Antivirus & Smart Security for more than two decades, the favorite antimalware solution of IT experts and gamers. Blocks attacks specifically designed to evade antivirus detection. Protects against attacks on web browsers, PDF readers and other applications, including Java-based software. Makes it possible to detect thousands of related malware variants, including new or previously unknown ones. ESET Internet Security runs on any system with Microsoft Windows 10, 8.1, 8, 7, Vista, and Microsoft Windows Home Server 2011. Product requires an internet connection. Текущее время: 12:17. Часовой пояс GMT +1.